Flexing pitch in the main window's tracks area. Learn how to Flex Pitch like a pro in Logic Pro X.
Logic’s powerful Flex Time engine has been expanded to include Flex Pitch for editing the pitch of monophonic audio material. This long-awaited flex algorithm means Logic users no longer need to transfer or record into a separate application or plug-in to make pitch adjustments — at least on monophonic material. Below are the basics for newcomers to Flex Pitch and to pitch correction itself, as well as a few power tips for those who have already dug into pitch editing in both the Main Window and the new Audio Editor. Select an audio track with a vocal file from one of your own projects, or grab a vocal Apple Loop to experiment. Click the Flex View button in the menu bar. The Flex tool icon looks like a bow tie and turns purple when active. Click the Flex button in the track header of the audio track you want to edit. Select Flex Pitch from the pop-up menu of Flex algorithms in the track header. 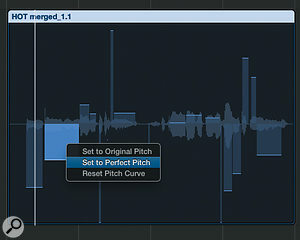 Power Tip: Hold Shift while selecting Flex Pitch to assign to all audio tracks at once. Your audio file is now analysed with a pitch detection process. The white bar graph represents the actual pitch. Drag up and down on a note to hear and adjust the semitone variance in pitch. The pitch deviation of individual notes from their perfect semitone is shown as bars overlaying the audio waveform in the background. The zero horizontal line represents perfect pitch. The horizontal width of bars represents the length of notes. Upward bars represent sharp notes; downward bars represent any flat notes. The vertical display range is +/- 50 cents in either direction, which is half a semitone, a semitone being 100 cents. A nice graphical detail is that you continue to see the original audio waveform. If you click-hold on a pitch bar, you hear that note. There’s a pop-up display of the note position, target pitch and how far off the note is in cents, which should help you make an educated pitch adjustment. Control-click on an individual bar and choose ‘Set to Perfect Pitch’ from the shortcut menu. Or, control-click on the audio region and choose Set all to Perfect Pitch from the shortcut menu. To reset notes to their original value, Control-click an individual bar and choose ‘Set to Original Pitch’ or control-click the region and choose ‘Set All to Original Pitch’ from the menu. In many situations you won’t want perfect pitch, you’ll want to split the difference. Drag the bar toward or away from the zero line manually. Again you can adjust between plus and minus 50 cents. Power Tip: Shift-double-click a bar to select all the bars in that region if, for example, you do want to try them all at perfect pitch. Control-click on an individual bar to reveal the menu for setting perfect pitch. You can edit the timing and various pitch-related parameters of audio material with much greater detail and depth in the new Audio Track Editor. Be careful though, you might sit down at someone else’s computer and not see the Track Editor at all! Make sure Show Advanced Tools is enabled (Logic Pro X Menu / Preferences / Advanced Tools / Show Advanced Tools). This preference is off by default for new Logic users with no previous version of Logic on their computer. To open the Audio Track Editor, click the Editors button in the Control bar or double-click on the audio region in the Main Window. Note: Increase the display size of the Audio Editor by dragging up between the windows — the Main Window and Track Editor — for more elbow room. Enable Flex View inside the editor by selecting the same bow tie-shaped icon as in the Main Window, then select the Flex Pitch algorithm. Notice the audio is now visible as individual objects displayed like notes in the Piano Roll Editor. You can now edit the pitch, time position and length of notes, virtually as you would edit MIDI in the Piano Roll. To adjust the pitch, drag a note vertically. The notes identified by Flex Pitch have ‘hotspots’ you can use to edit pitch, flatten vibrato, and adjust pitch drift, gain and other parameters. This allows you to make your edits without ever having to switch tools. 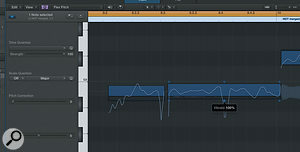 Zoom in as needed to work on the different zones and parameters of the audio note’s pitch. Roll over a note, then roll over the control points that appear, to see what each does. Adjusting 'hotspots' in the Audio Track Editor. Simply drag a control point to make the edit. Drag the upper-left hotspot vertically to edit the pitch drift (how much the note slides) at the start of the note. Drag the upper-right hotspot vertically to edit pitch drift at the end of the note. 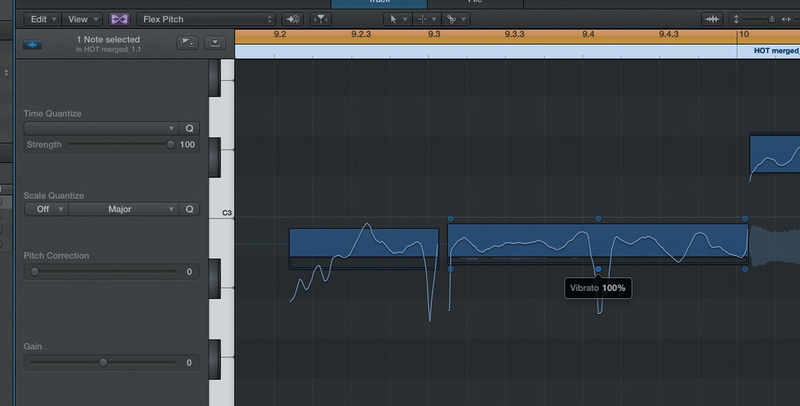 To edit vibrato, drag the lower-middle hotspot vertically. To edit gain, drag the lower-left hotspot vertically and watch the waveform update in real time. To make any fine-tune pitch adjustment, drag the top-middle hotspot vertically. To edit the formant shift, drag the lower-right hotspot vertically. Select the Scissors tool and split a note to work on any of these adjustments on just a portion of the original note. If you go too far though, control-click the region, (not the hotspot) and choose ‘reset pitch curve’ to reset pitch drift and vibrato. You can’t reset gain or formant shift. Use 'Reset Pitch Curve' to reset pitch drift and vibrato. You can quantise — or automatically correct — the pitch of notes here as well. This only works for single-note, monophonic audio regions, not chords or un-pitched sounds. By default, notes are adjusted to the closest note on the chromatic 12-note scale. Select the notes then drag the Pitch Correction slider on the left side of the Editor to the right to increase the amount of tuning adjustment. Drag to the left to decrease. To quantise the pitch to a particular key or musical scale, choose the scale and key (major or minor) from this Scale Quantize pop-up menu. You can also change the gain of audio regions between -30 to +30 decibels. Select the regions you want to adjust when Flex Pitch is enabled then drag the Gain slider horizontally on the lower-left to adjust.With Flex Pitch enabled, you can quantise the timing of audio regions, whether they’re drums, single-note instruments, or even chordal and polyphonic instruments. Choose Flex Pitch then choose the note value for your timing quantisation from the Time Quantize menu. Adjust the Strength slider to the left to decrease the strength of quantisation. 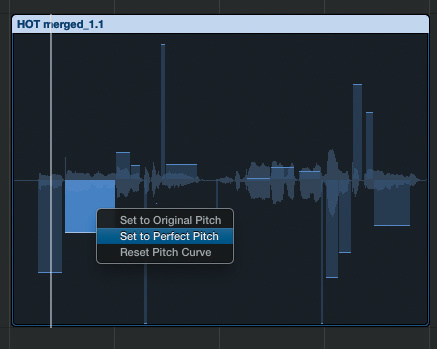 Quantising pitch, musical scale and time with the Flex Pitch algorithm.You can perform Flex Time edits using the Flex algorithms available in Logic Pro 9 after flexing the pitch. Flex Pitch edits are suspended while using a Flex Time algorithm. To hear previous Flex Pitch edits, switch back to the Flex Pitch algorithm after making your Flex Time adjustments and your Flex Time edits will be preserved. It is probably best to do your time and pitch edits for mono material with the Flex Pitch algorithm inside the Audio Track Editor, and not switch back and forth with the Flex Time algorithms whenever possible. A really creative feature with Flex Pitch in the Audio Tracks editor is under the Edit menu, ‘Create MIDI Track from Flex Pitch Data’. Double vocals or any live instrument recording with cool synth leads or a vocoder for emphasis. This opens up infinite possibilities for not just supporting a vocal melody but orchestrating your music and building the arrangement. A clear advantage with Flex Pitch over other working methods is that there isn’t a lot of tool switching. Most Logic users will likely find the workflow streamlined over other methods of pitch correction for this reason alone, not to mention the convenience of staying inside Logic to make adjustments.